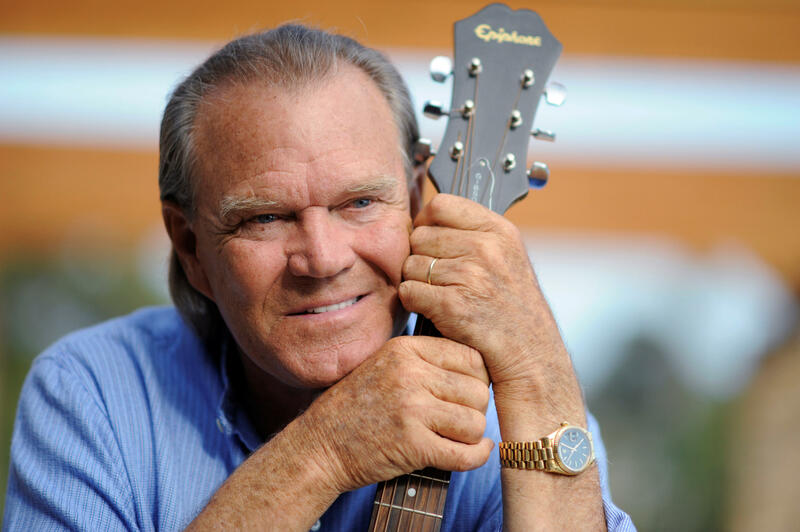 NASHVILLE, Tenn. -- Glen Campbell, the grinning, high-pitched entertainer whose dozens of hit singles included "Rhinestone Cowboy" and "Wichita Lineman" and whose appeal spanned country, pop, television and movies, died Tuesday, his family said. He was 81. Campbell was considered country's first crossover star, but he told Anthony Mason on CBS' "Sunday Morning" that he never thought of himself as a country singer. "No, I'm a singer, and I really like good songs," he said. Campbell was one of the biggest stars of the late 1960s and 1970s. He sold more than 45 million records and had 12 gold albums and 75 chart hits. One of 12 children of an Arkansas sharecropper, Campbell first picked up a guitar at age 4. By the early '60s, he'd played his way to L.A. Though he couldn't read music, Campbell quickly became one of the most sought-after guitarists in the city, getting a lot of session work. He told Mason that time felt "great ... I bought a car!" He went on to play guitar for Frank Sinatra on "Strangers in the Night," for the Monkees on "I'm a Believer," and he filled in for Brian Wilson for six months when he took a break from the Beach Boys. Campbell crossed into acting, co-starring with John Wayne in the 1969 movie "True Grit" and had a weekly audience of some 50 million people for the "Glen Campbell Goodtime Hour" on CBS from 1969 to 1972. "Rhinestone Cowboy," released in 1975, was his first Number One record. A dark period followed. He became a tabloid mainstay after an affair with fellow country singer Tanya Tucker, who called him "the horniest man I ever met." Their affair was fueled by drugs and alcohol, and he spent the late '70s and early '80s drinking heavily and using cocaine. Campbell told Mason that he went "crazy" and stupid" during that time. Over the course of his career, he released more than 70 of his own albums, and in the 1990s recorded a series of gospel CDs. A 2011 farewell album, "Ghost On the Canvas," included contributions from Jacob Dylan, Rick Nielsen of Cheap Trick and Billy Corgan of Smashing Pumpkins. In 1975, when he heard the demo of "Rhinestone Cowboy," he thought it could become his signature song. He told Mason he knew right away he wanted to record it. "Oh yeah. 'I've been walking these streets so long singin' the same old song.' That was just perfect." Campbell was married four times and had eight children. His youngest daughter, Ashley, said in a tweet Tuesday she is "heartbroken." "I owe him everything I am, and everything I ever will be. He will be remembered so well and with so much love," she posted.